Despite the above findings, the Substance Abuse and Mental Health Services Administration (SAMHSA) reports that “Rates of alcohol use disorder have declined in all age groups relative to 2015.” But why don’t more addicts seek help? What’s holding them back? There are so many barriers that stand in an addicts way, and we can’t help our loved ones if we can’t understand what may be stopping them from seeking help. While you might feel inclined to judge, you must not. Instead, you must emphasize—recovering from addiction is easier said than done. 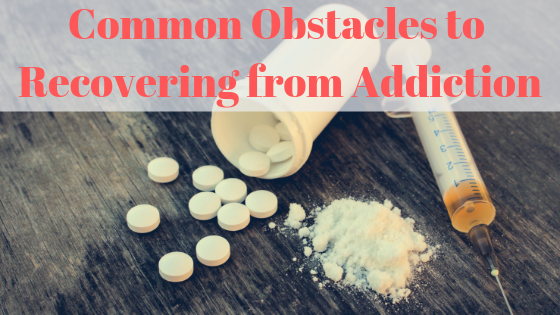 Many addicts face the following five obstacles. SAMHSA also reports that 17.1 million addicts needed treatment but refused it because they felt they did not need help. Despite hardships addicts face, they do not see—or do not care to see—a problem. The fear an addict feels is often twofold. On one hand they fear going to rehab. On the other hand, they fear what recovery means. A lifetime process, recovering from addiction is not quick—and it is by no means easy. It takes commitment day in, day out. Checking into a rehab center takes courage, motivation, and determination. Detox can be physically uncomfortable, and therapy unearths painful memories and emotions that have been shoved down for years. There is a real stigma surrounding addiction. A lot of substance abusers do not want others to know that they are struggling. Shame is often the most overwhelming and painful feeling—making it an immense barrier to recovering from addiction. Addiction does not discriminate, and seeking help is a sign of immense strength. Addiction does not develop overnight, and neither will recovery. We must stand by the side of the addict in your lives and let them know that the time is necessary, regardless of how long it will take. The cost of help is yet another obstacle to recovery. Many rehab facilities accept a wide range of insurance and are more than willing to work with clients who do not have any health insurance whatsoever. Affordable help is always available, whether it is Minneapolis rehab facility, a Portland DUII law firm, or a recovery hotline.